This week was my second visit to the city, and the first time that I really had a chance to play tourist. You can find some of my favourite pictures over on Flickr. The first time I visited the city I knew I liked it, but I really couldn’t articulate why. I had just recently been in Paris and the way I explained it was “Paris is chic, Berlin is cool”. Which is true. But after looking over the pictures from this week, I realized a least part of the reason why I love Berlin is that it goes past the other major European cities in revealing its past. London, Paris, etc. make a point of showing off their history. Berlin puts the burden of its history front and centre. From the statue of a scowling Soviet soldier, to the unrepaired bullet holes, to the Holocaust Memorial, Berlin gives equal time to its unpleasant past whereas the other cities only reveal their glories. The whole history is there to find on public display, not just the victories. That’s not to say that Berlin is sombre. The public art is incredible with a very cool mix of classical and modern. The street scene is hopping with some of the best buskers I’ve seen anywhere. If you haven’t thought of Berlin as a travel destination, think again. It is a very walkable and lovely city with great hotels, restaurants and bars. I will definitely be going back. Next time I hope to be able to spend some significant time visiting the museums. From all reports they are incredible. If you go the Holocaust Memorial don’t just look at it. Walk through it. If you haven’t been disoriented in the middle of it, you’re missing the point. I can highly recommend both the Westin Grand and the Intercontinental hotels. Especially the latter, as its location close to the Tiergarten, Zoo and Breitscheidplatz are hard to beat. They’re certainly not cheap, but they are both excellent. If you have the legs for it, the view from the top of the Victory Column (Siegessäule) is pretty incredible. But your legs will be burning by the time you walk to the top. The public transit is outstanding. I used the ICE to get there and the U-Bahn, S-Bahn and buses in the city. Clean, reliable and on-time. I travel a lot in Europe and love the high speed rail system. In fact, I am sure that I am one of the very few Canadians that hold a Deutsche Bahn 50 frequent rail traveler discount card. 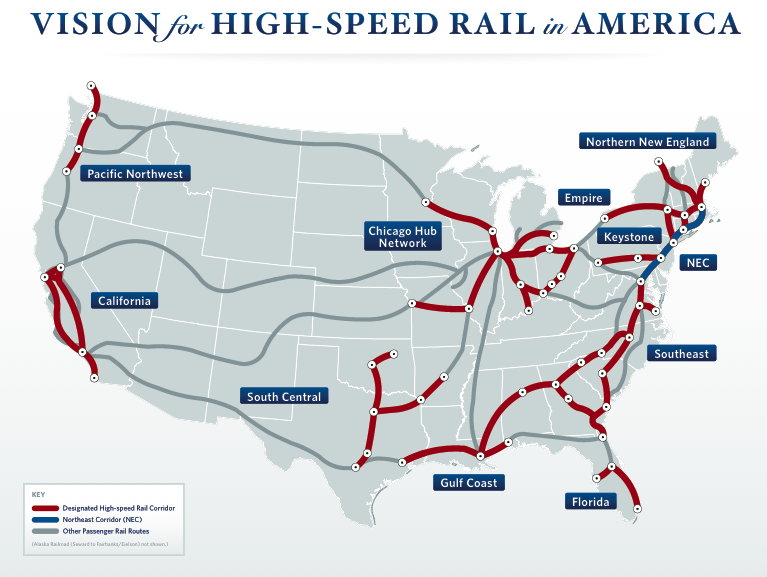 So I thrilled to see that the Obama administration’s announcement today that they’re pushing for a quite complete high speed rail system for the United States. But I got really excited when I noticed the little northern leg on this map. I poked around a little bit, and yes it seems that a high-speed rail corridor is on the plan from Boston to Montreal. I wonder what this means for a Canadian high-speed plan? If that linked to the often-rumored Toronto-Ottawa-Montreal rail link, that would be very cool. Update: There is also a link in the Pacific Northwest that goes up to Vancouver. Boy, I bet Bombardier is licking their chops on this opportunity. Ian Skerrett, Ralph Mueller and I are in Berlin this week for the OSGi Community Event. We haven’t had too much time for touring, but I did manage to take a couple of quick photos. The happy shot of Ian, Ralph and Naci Dai was taken at a Greek restaurant where we watched Greece play Sweden in the Euro Cup. It was good fun to soak up their enthusiasm for the game. But the crowd got pretty quiet as Sweden scored two quick goals in the second half. I really like Berlin. It has a very nice, relaxed urban vibe. It’s a lot more colourful than Frankfurt. I would definitely like to come back and play tourist here some day. I took the Nikon to Paris on my trip there this week, but unfortunately had very little time for playing tourist. Ralph and I had one free evening to walk around, and the light was only so-so. We were staying in Montparnasse, which was definitely my favourite location so far in my trips to Paris. The hotel was right across the street from the Gare Montparnasse train/metro station, so getting everywhere was very simple. And its a great Paris neighbourhood. Real people live there, with some great local bistros to enjoy. I’ve posted some pics, including a few that I took out of my hotel window. You learn a lot about a city by watching how its taxis work. New York: annoying but efficient. Chicago: dirty and surly. Paris: clean but impossible to find when you need one. SFO to downtown and back in 30 minutes is not humanly possible if you drive anywhere even close to the speed limit. We are talking some serious velocity requirements. The good news is that when it is 1:30am according to your body clock, there is nothing like being in a cab doing 90++ weaving through traffic on the 101 to keep you awake. …actually I think I hate ORD even more, but today is Air Canada’s turn to ruin my travel plans. So today I’m flying from FRA->YYZ->YOW (Frankfurt, Toronto, Ottawa for the non-flyers). The flight from FRA to YYZ was perfect. It hit the runway on time to the minute. So far, so good. Then they put us on a what felt like 15 minute bus ride from the infield terminal to the shiny new Terminal 1, where we cleared customs. I was all happy, so I gave Cathie a call to tell her that everything was going perfectly. A few minutes later she called me back to tell me that she had seen on-line that my flight had been cancelled. To make a long story short, my 17.10 arrival time is now 22.10. So I’m back home after a tiring trip to California. I had dinner with Mark, Claire and Alex last night at Il Fornaio in Palo Alto. We swapped Christmas presents and had a great meal. I’ve been to that restaurant a number of times before, and it’s always been great. I bumped into Tim O’Reilly and Allison Randall there, as they were celebrating Allison’s birthday at the table beside us. Yet another reminder that it’s a small world. I am heading to San Francisco tomorrow (Monday, Dec. 11) for the Eclipse board meeting and other random meetings. I’m hoping to have dinner with Mark, Claire and Alex on Thursday night. But what I’m really hoping is that my upgrades for the flight home will come through!